We’re all familiar with the problem… you’re totally in love with your new woollen sweater and you wear it as often as possible. But after wearing it a couple of times, your sweater already shows those annoying tiny fuzz balls. When it comes to pilling, no sweater is safe. We explain how pilling happens, but more importantly: how to get rid of it! First, we would like to clear things up. The fact that certain garments show pilling, has nothing to do with either price or quality. it’s simply an inescapable characteristic of many types of wool. Even the most exclusive sweaters aren’t immune to pilling, because every moment of wearing or washing creates fabric abrasion and abrasion is the biggest cause of pilling. Every fabric has its pros and cons and overall, the rule states: the more wooly or hairy the fabric, the shorter the fibre, the more the fabric is likely to pill. 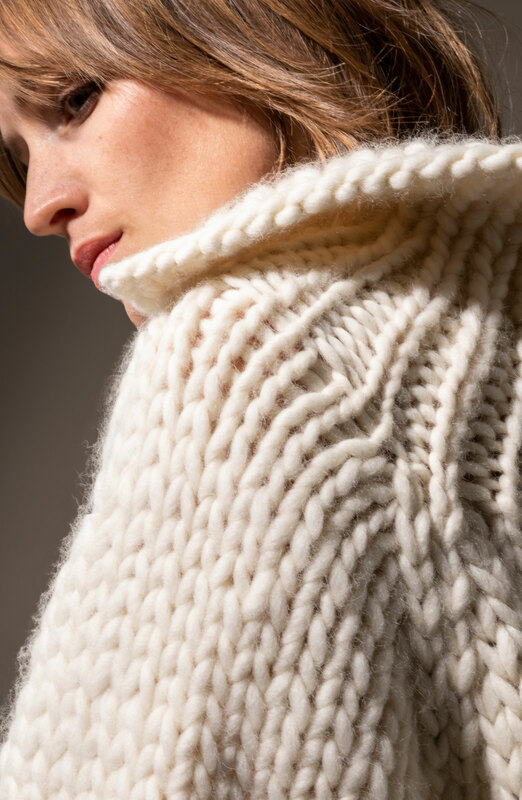 Chunky and loose knits have a greater risk of pilling then heavier, more compact knits. But if you’re a lover of chunky-knit items, we totally understand that you wouldn’t give them up. So, it’s with love that we share our tips & tricks to prevent and remove pilling. 1. Leave your garment to rest for at least 24 hours between wearing. Stretched or damaged fibres are given the chance to ‘recover’ naturally. 2. Always wash according to the label. They’re there for a reason. 3. Always use a mesh washing bag to prevent unnecessary abrasion. 4. Use a hand steamer to postpone washes. Steaming is also a safe way of cleaning and refreshing clothes. 5. Always store wool garments folded. Don’t forget to leave plenty of surrounding space in your closet. 7. Never tug the pills. This only causes further damage. 8. Never use a disposable razor to remove pills. This ups the risk of more damage. 9. Use a sweater comb, pumice or clothing brush to get rid of light pilling. 10. Always use a professional wool razor. View the tutorial below on how to use it properly. Check our collection of wool razors and other laundry tools below to make sure your favorite items will looks like new again.